There is a strong and indelible bond between Shakespeare and music. Many of his plays contain songs and ballads (for which the author often supplied the texts) while incidental music was often added by celebrated composers for specific productions of his plays. 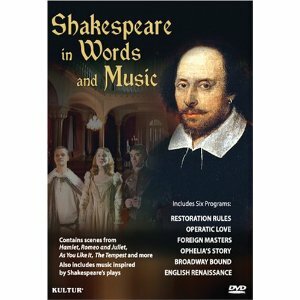 This DVD presents six half-hour programs that contains certain spoken texts (from his plays or poetry) and linked musical excerpts within a given theme. The programs are centered on vocal excerpts but also contain instrumental and chamber-music pieces, directly derived from and inspired by the works of William Shakespeare. The six episodes are centered on the following themes: Restoration Rules, Operatic Love, Foreign Masters, Ophelia’s Story, Broadway Bound and The English Renaissance. Sounds interesting, right? Wrong. There are annoyingly bad actors jumping around doing a painful job with their lines and not doing much to explain why certain lines were selected or how they link to the ensuing music. The music is fine, but I had no understanding of how it related to Shakespeare. Much of it is sung in foreign languages with no translation or it’s instrumental with no explanation. I could not even get into the Broadway Bound episode with music from West Side Story. It was sung by an opera singer which just annoyed me more. I kept thinking why not get West Side Story on Netflix and actually enjoy the song and dance?